Over the past eight months, a number of articles have appeared on The Rational Walk related to the Deepwater Horizon disaster and related investment opportunities. Value investors know that times of stress and uncertainty create opportunities in the financial markets whether the turmoil is due to natural disasters, political unrest, or the fallout from accidents such as the Deepwater Horizon incident. Mr. Market always sells entire industry sectors indiscriminately first and asks questions later. The key question for investors involves judging where the true opportunities exist and avoiding value traps that carry risk of permanent loss of capital. As things have turned out, investors would have done well to buy any of the stocks impacted by the Deepwater Horizon disaster including BP and Transocean. In fact, many smart investors purchased BP stock in the wake of the disaster and have done very well. Rather than attempting to judge the probability of ruinous consequences for BP and Transocean, we decided to focus attention on companies that were not directly involved in the disaster but had been punished by the market nonetheless. This research resulted in taking a position in Noble Corporation on June 3. This position has now been closed for a total return of 38.5 percent compared to a return of approximately 20% for the S&P 500 ETF (SPY) during the same period (both figures include dividends). 1. Noble’s historical performance had been very strong over a long period of time and management accomplished the track record with a minimal amount of leverage. Looking at Noble’s record from 2000 to 2009, we observed that margins and return on equity had dramatically accelerated as the price of oil skyrocketed during the latter part of the decade and that the company appeared to be managing through the dramatic decline in oil prices that took place in 2009 partly due to long term contracts at historically high dayrates. 2. Noble had a very strong record of free cash flow generation over the past five years and management appeared to have a solid strategy in place that balanced returning cash to shareholders and funding the company’s newbuild program. 3. From a geographic perspective, Noble was clearly exposed to the Gulf of Mexico but over 77 percent of revenues were attributed to other countries, with Mexico accounting for 23 percent of 2009 revenues. We hypothesized (incorrectly as it turns out) that Mexico may be a destination for idled rigs in the U.S. Gulf of Mexico in the event of an extended moratorium. 4. Based on an observation of the importance of deepwater exploration for the energy security of the United States, we believed that a permanent ban in the Gulf of Mexico was unlikely and that once the Macondo well was capped, a more reflective political environment would result in relaxation of the ban. Noble acquired Frontier Drilling. We covered the announcement when it was made on June 30, 2010 and noted that the deal was funded with cash that Noble planned to raise in debt offerings. The deal appeared to be done on attractive terms for Noble and was possible only because of the company’s previous aversion to debt. The company also announced a major agreement with Shell that added significant backlog and ensured the continued utilization of the acquired Frontier fleet. The dayrates and terms appeared to be attractive. Overall, this appeared to be a positive development, although the increase in financial leverage slightly increased the risk profile of the company that was built into our initial investment thesis. 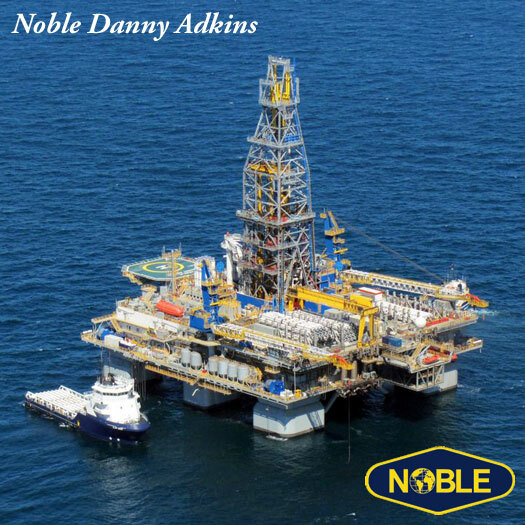 Noble announced solid Q2 2010 Results. Although results were negatively impacted by the fallout from the Deepwater Horizon disaster, Noble posted respectable Q2 results which we analyzed on July 20, 2010. We noted that negative trends were emerging in the jackup fleet in terms of utilization and dayrates and that overall fleet utilization declined. We presented a ten quarter summary of Noble results to examine trends over a longer period of time. While trends were somewhat negative, Noble still managed to post healthy cash flow for the first half of 2010. Noble Q3 2010 Results Impacted But “Worst May Have Passed”. Noble posted a sharp fall in contract drilling revenues for the third quarter despite the addition of the Frontier rigs. We covered the quarterly release on October 21 and noted continuing drops in fleet utilization and dayrates. Although the results were disappointing, the Obama Administration had recently lifted the official moratorium and it appeared that Q4 results would be materially better. Based on our analysis of the fleet and contracted dayrates, we estimated that contract drilling revenues would rise to the neighborhood of $630 million in Q4. Noble Q4 Results Announced. On January 26, 2011, fourth quarter results were announced. Although contract drilling revenues were higher that Q3 at $614.5 million, the results fell short of our $630 million estimate partly due to a major drop in utilization for the semisubmersible fleet and dayrates that remained at depressed levels, although with a slight improvement from the third quarter. A number of jackup rigs operating in Mexico were moved to the Gulf of Mexico and warm stacked. In the conference call following the earnings release, management guided analysts to expect a capital expenditure program of approximately $2 billion for 2011. Based on our analysis of Noble’s fleet based on the latest fleet status report, it appears nearly certain that contract drilling revenues will decline significantly in the current quarter. Based on our estimate, contract drilling revenues could fall to the $510 to $520 million level for the quarter due to declining revenues in Mexico, West Africa, the Arabian Gulf, and Southeast Asia. Click on this link for our analysis of the latest fleet status and revenue projections for Q1 2011. One of the dangers facing investors involves not having a firm sell rationale in place at the time of purchase. When a security is purchased, the investor should not only describe the reason for the purchase but also consider the conditions under which the position should be liquidated. Some may criticize this approach as deviating from the “buy and hold” school of investing and at odds with value investing in general but nothing could be further from the truth. Value investing is about buying undervalued securities, but without a solid sell discipline, good analysis at the outset can be diluted by failing to act when an investment thesis has played out. In the case of Noble, the investment thesis was based on the market’s severe overreaction to the Deepwater Horizon disaster and the subsequent pummeling of nearly all stocks associated with offshore oil and gas exploration. Based on the factors discussed above, Noble appeared to be trading at a depressed valuation relative to our evaluation of its long term normalized earnings power, free cash flow generation capability, and risk profile based on financial leverage. Our investment thesis was not based on the price of oil. While Noble has performed as well as one could expect in light of subsequent events and made an opportunistic acquisition that could provide long term benefits, financial leverage is higher than it was at the time of purchase and it appears to be headed higher. Given the fact that free cash flow generation in 2011 is highly unlikely to approach the company’s $2 billion capex program, more debt may be required to fully fund these initiatives. One of the main dangers investors face involves changing the investment rationale as a stock price advances. To justify holding Noble Corporation at $38 requires a completely different investment thesis than purchasing shares at under $28. One could come up with a solid investment thesis for Noble even at today’s price given the company’s newbuild program, healthy backlog, capable management team, and prospects for higher oil prices to support expansion of dayrates going forward. However, this was not our investment thesis. At the time of purchase, our price target was in the low to mid 40s; however, this target did not account for the higher leverage and the poorer than expected results over the past two quarters and prospects for higher debt going forward. As a result, it seems more prudent to declare victory and move on to other opportunities. Disclosure: The author of this article sold his position in Noble Corporation on February 1, 2011. This article is not investment advice — see our disclaimer for more information. By using this site, you agree to our terms and conditions. My analysis and buy/sell timing was remarkably similar. I managed to pick up shares below $30 and sold out after the index announcement. I’m bullish on oil long-term and think that NE will do just fine, but I’m growing less bullish on the overall market lately and trying to raise cash. NE was designed as a medium-term play for me due to short-term volatility in the drilling market. Thanks for explaining your rationale. Just saw this – Noble prices offering of senior notes: http://www.reuters.com/finance/stocks/keyDevelopments?rpc=66&symbol=NE&timestamp=20110131222300 Apparently part of the proceeds will go toward ’11 capex so I think the idea that leverage may further increase had merit. It’s admirable to stick to your original thesis. I had the same one going in but am taking a different route now. I have rationally assessed future newbuilds, developments, and opportunities for Noble’s future. I think that there is a good probability that you will be correct and do well with Noble going forward. I do question whether the market understands the degree to which contract drilling revenues are likely to fall in Q1 (assuming the analysis I posted is in the ball park). And I think that free cash flow is going to be inadequate to cover capex. However, looking a couple years out when the new rigs are online and hopefully generating good dayrates, I think Noble will be doing just fine, assuming healthy oil prices. From prior experience I know that modifying an investment thesis once a stock has achieved its initial objective can be dangerous. There are lots of psychological reasons people hold on to winners for too long. I believe in buy & hold in many cases but in special situations like taking advantage of the Gulf panic, I think it’s best to avoid getting attached to winners once they have played out.